Ronnie Defeo is the culprit behind the Amityville massacre. Mark David Chapman assassinated John Lennon. These men were both found guilty by a jury and sentenced to incarceration… but was that the right way to treat these two? As a former law school intern at the District Attorney’s office, I worked hard to put the bad guys behind bars and let the wrongly accused walk free. I also strived to make sure that the mentally unstable went to a hospital and not prison, where they would be medicated and treated. I never considered that my clients should have gone to church and had an exorcism. Ronnie DeFeo has claimed many, many things about the killing of his family. His story has changed nearly countless times. There were claims by the family who moved into the Amityville house (the Lutzes) that the house was haunted. However, the claims turned out to be a hoax. A profitable book and movie, but a hoax nonetheless. DeFeo then used the story concocted by the Lutzes as a gateway to claiming he was possessed. 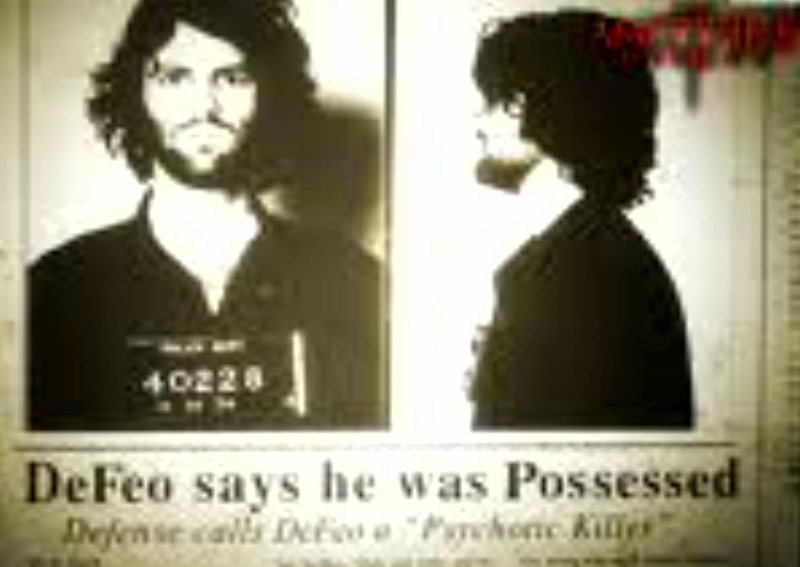 Possession is not a legal defense and some claim the issue was not brought up in DeFeo’s trial but it should be noted that the Lutzes didn’t move into the (fake) haunted house until a month after DeFeo’s trial, meaning that the scapegoat of demonic possession hadn’t arisen from the hoax at the time of DeFeo’s trial. However, other authors contend there is testimony by DeFeo claiming he was, in fact, possessed by Satan. Perhaps someone should order a transcription of the trial to end this debate. DeFeo did testify, however, that it felt like someone else was moving inside of him and he couldn’t stop killing if he wanted to. Later, DeFeo told the author of Murder in Amityville anything he wanted to hear in hopes that the author, Hanz Holzer, would share royalties. The division of profit never came to fruition and later DeFeo returned to denying the house was ever haunted. Holzer stands by his assertion of possession and to prove his point, Holzer brings in a psychic who held a séance that confirmed DeFeo was possessed by the angry spirit of an Indian chief. On the other hand, DeFeo’s father was quoted as saying that he had a devil on his back, but that could mean any number of things – guilty conscious, bad drinking habit, his son, etc. According to Ed Warren the DeFeos held a special mass in their home and during said mass a lot of paranormal phenomenon happened. However, the church allegedly involved in the mass denies any knowledge of a priest being involved with such an incident. Churches are known to deny such things so who knows if it really happened. The DeFeo housekeeper said Mrs. DeFeo often spoke about a terrible tragedy that was going to befall her family. Was this a premonition or just an astute observation about the disengaged and dysfunctional DeFeo family? Was DeFeo possessed or just a lunatic killer? As a friend once told me, it is between him and his God. When he got older he began praying to Satan for strength, asking Satan to send his most powerful, experienced demons, “not little ones but big ones to do a big thing.” Perhaps his prayers were heard. At one point, he was praying while his wife slept in the next room. Allegedly he prayed: “Hear me, Satan… Accept the pearls of my evil and my rage. Accept these things from deep within me. In return, I ask only that you… I ask only that you give me the power… The power to kill John Lennon. Give me the power of darkness. Give me the power or death. Let me be a somebody for once in my life. Give me the life of John Lennon.” And it was so. Since Chapman had plead insanity originally, he was given the once over by a myriad of psychologists and psychiatrists. One such evaluator stated that “whatever Chapman’s reasons for killing the rock superstar, those reasons were part of a complicated riddle that lay beyond the realm of modern psychiatry as she knew it.” The mental community struggled to understand, explain and/or describe the medical symptoms of a spiritual battle that Mark Chapman says raged within him his entire life. Chapman later changed his plea to guilty because he felt it was the will of God. Now before we go ahead and call him a lost mental cause or a form of martyr, Chapman was suicidal from depression and, one could argue, delusional long before the John Lennon/Catcher in the Rye came about. He drank heavily, was obsessive about things he enjoyed (art, the aforementioned book, an affair he had, music and of course, John Lennon). By age 14 he was on drugs and skipping school. He talked with imaginary little people that lived in his walls and pretending to be their king. He told a friend in a letter that he was “going nuts.” Those are all key indicators of a mental problem and not a religious/soul problem. Chapman went to high school down the road from my current location. He attended Columbia High School in Decatur, GA. He became a born again Christian (as many in the South do) and took to the local Presbyterian church (Chapel Woods). He attended an evangelical college in Lookout Mountain, GA. Could his deep immersion in the Bible Belt and biblical studies have played a role in what was to come after the murder? Remember, after Lennon was (mis)quoted as saying the Beatles were bigger than Jesus, the South rioted. Chapman felt Lennon led a life of blasphemy and hypocrisy. How can Lennon preach love and peace, Chapman wondered, yet not thank God for his life of wealth and celebrity? It took six men to drag him into a van that took him to Bellevue. Granted Chapman was a large man but that’s still super human strength. Once there he did not answer to the name Mark Chapman. He would speak to doctors in voices they had not heard before: one a high pitched, female voice, the other a low, snarling and aggressive male. The voices identified themselves as Lila and Dobar, emissaries of Satan. It was Lila’s first possession of a human, Chapman later told his co-counsel, David Suggs, and she was struck by the weakness of the human body. Dobar was the more powerful demon – thousands of years old, exceedingly well versed in biblical scripture and a member of the Supreme Council in Hades, a ruling body whose power was only exceeded by Satan’s. Chapman noted, however, that Lila had the power to release and contain Dobar; he thought perhaps this was because Satan didn’t trust him. He said that both demons could read his mind and that their purpose in possessing him was to make a showing of Satan’s presence in the world. Here is the last piece of the puzzle for you to consider. 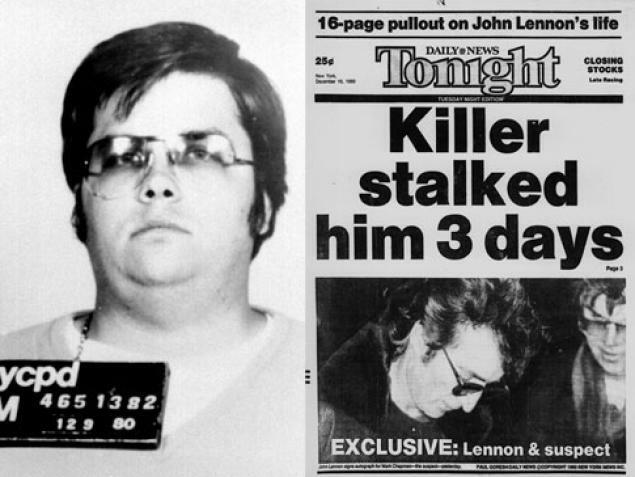 Supposedly, Chapman was commanded by two evil spirits in a home in Decatur to kill John Lennon. The family that lived in the house noticed their daughter would exhibit strange behavior when they lived there, and it stopped when they would go out of town. LP’s own Chip Coffey has spoken with the family and asks what the likelihood of Chapman making up a story to coincide with a haunting that no one outside the family knew about.